A video has been released in Nigeria purportedly showing the leader of the Islamist militant group Boko Haram alive. In August, the Nigerian military said it might have killed Abubakar Shekau during a shoot-out. In the video a man believed to be Mr Shekau said the world "should know that he could not die except by the will of Allah". Other previous reports of his death later proved to be unfounded. Boko Haram, which is fighting to create an Islamic state across Nigeria, has been blamed for many violent attacks which have killed nearly 2,000 people since 2011. In the video, the man alleged to be Mr Shekau sits in a jungle environment surrounded by dozens of lieutenants dressed in fatigues. He makes reference to recent events, such as an attack in Benisheik, Borno state, on 17 September in which at least 142 people are reported to have been killed. BBC Hausa's Aliyu Tanko says the man's voice sounds like that of Shekau, and the video emerged from a source previously used by the Boko Haram leader. On 19 August, the Nigerian military said intelligence suggested it might have killed Mr Shekau between 25 July and 3 August. 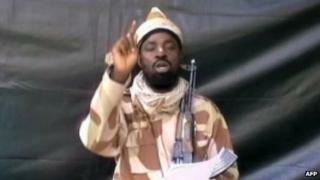 It claimed a video apparently showing Mr Shekau and circulated to journalists on 12 August was acted by an impostor. But hundreds of people wrote in to the BBC's Hausa social media pages to express their scepticism at the announcement, which coincided with the Nigerian authorities' launch of a new brigade with special responsibility to tackle Boko Haram. There was no independent confirmation of the army's claims.